In 1956, Olive Higgins Prouty became the benefactor of a sacred healing garden, known worldwide as the Prouty Garden, at the famed Boston Children’s Hospital. The agreement was that the garden would exist “as long as there are patients, families and staff to enjoy it.” Sixty years later the Prouty Garden is being replaced by a new billion-dollar complex. What began as an online petition by the Friends of the Prouty Garden blossomed into a four-year movement to persuade the hospital to use one of their many alternate location plans that protected the Prouty Garden. The story is told by the Friends of the Prouty Garden, health care providers, patients, parents, and experts in healing gardens who deliberate on the issues of pediatric wellness and the vital role of nature in healing. 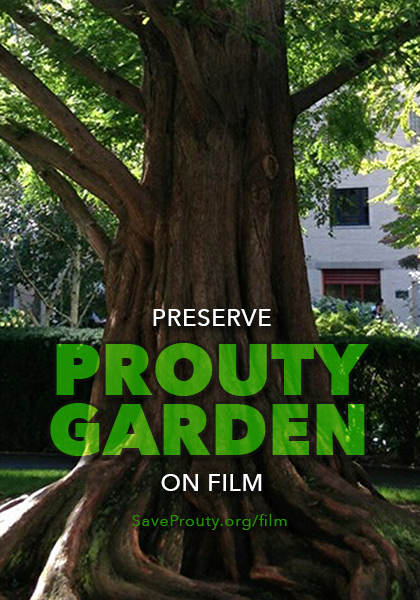 The film honors the history of the Prouty Garden and provides a sobering look at how the economics of health care can affect the core values of the medical profession. In order to complete the film in a timely manner, we need your support. For your tax-deductible contribution, you will receive a tax receipt from our 501(c)3 fiscal sponsor, Filmmakers Collaborative. Thank you for your continued support. We will be updating this page as the film progresses.